Note : Answer any FIVE full questions. 1 a. Define diffusion capacitance. Derive an expression for the same. b. Draw the piece wise linear V-I characteristics of a P-N junction diode. Give the circuit model for the ON state and OFF state. b. With necessary circuit and waveforms, explain a bridge rectifier circuit with capacitor filter. Derive an expression for the ripple factor. 3 a. Design a full wave rectifier filter to meet the following requirements. DC output voltage = 15 V, load resistance = 1 K, rms ripple voltage on capacitor <1 % of dc output voltage. The AC supply voltage is 230 V at 50 Hz. 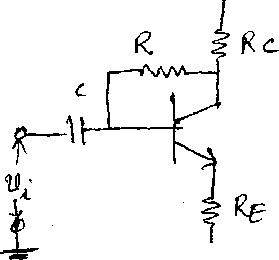 c. What do you mean by thermal runway of a transistor? Explain. 4 a. Obtain an expression in terms of ‘h’ parameters for a transistor as a two-port network. Using the above developed equations obtain the hybrid model of CE, CC and CB configurations. b. State and explain Millers theorem. 5 a. Derive an expression for: i) Input conductance (gb’e) ii) Output conductance (gcc) for a transistor at high frequency. b. Give the classification of multistage amplifier. Explain the various distortions in amplifiers. c. Discuss the general characteristics of a negative feedback amplifier. 6 a. Derive an expression for input and output resistance of a voltage shunt feedback amplifier. b. Explain the different types of power amplifiers. 7 a. Obtain an expression for the closed loop gain of a non-inverting amplifier. b. With necessary sketch and characteristic curves explain the operation of a Schmitt trigger. c. What do you mean by precision rectifiers? Explain full wave precision rectifier. 8 a. Explain the working of SAR ADC. b. Explain the working R – 2R ladder DAC. i) Square wave generator ii) To achieve variable duty cycle control.